A walk along San Diego's Embarcadero ("the landing place") provides a variety of waterfront activities, plus great views of the San Diego harbor. 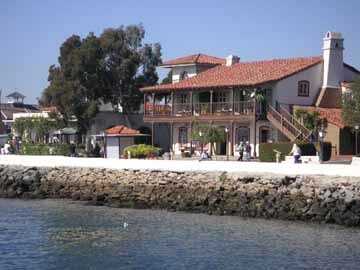 The walking tour begins at Embarcadero Marina Park, where you are surrounded by the bay on three sides. 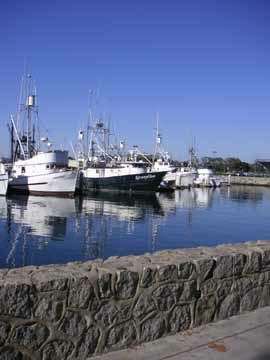 After passing the shops of Seaport Village, you walk by the piers of commercial fishing boats. Next you can visit the San Diego Aircraft Museum. Passing the harbor cruise boats, you arrive at the San Diego Maritime Museum, where there are several historic ships to explore. When you have finished the route, you might want to return to the Broadway Pier to take one of the harbor cruises for an extensive, personally conducted tour of the many sights and activities of San Diego Bay. Distance: One and a half miles, one way. Time: An hour or more, depending on how much is going on and how much time you spend at the museums. Allow extra time if you take a harbor cruise. Be careful of your time if you have a car parked at a location with metered parking. Begin your walking tour of the waterfront at the tip of Embarcadero Marina Park. If the day is windy, you may find some avid kite flyers here. Across the bay is the city of Coronado, connected to San Diego by the graceful San Diego-Coronado bridge. To the northeast, the pair of curved modern skyscrapers at the water's edge are part of the San Diego Marriott Hotel and Marina. 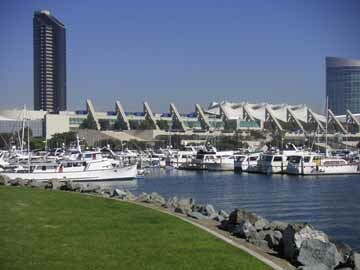 To the right of the Marriott is the San Diego Convention Center, site of the city's largest conventions. A short distance to the left of the Marriott is another pair of skyscrapers, the Manchester Grand Hyatt. Walk the length of the park, then turn left onto the path that runs along the bay side of Seaport Village, a popular shopping area featuring shops, restaurants, sidewalk eateries, and an 1895 carousel. As you leave Seaport Village, you come to a dock where commercial fishermen offload. If you are lucky, you may see them bringing in such catches as swordfish, rock cod, oopah, or shark. Another minute or so brings you to Tuna Harbor. This is the center for San Diego's commercial fishermen. On the inner sides of the piers are slips for the bait boats and gillnetters that offload at the dock you just passed. The bay side of the outermost pier is large enough to accommodate tuna seiners. At one time San Diego was home to the world's largest tuna fleet, dominated by the descendants of the Portuguese immigrants who founded the industry in 1911. The fleet grew until during the 1970's it had approximately 200 boats. Today, many families of tuna fishermen still live in San Diego, but the seiners are seldom seen here. With the increased fishing activity in the far Western Pacific and the closure in the early 1980's of both San Diego tuna canneries, fewer and fewer boats need to come to San Diego. Instead they are using canneries and getting their repairs and provisions at such places as Samoa and Puerto Rico. There is still a cannery near Los Angeles, which brings some boats into San Diego. Mostly, however, it is only the crews that return to San Diego, to visit their families here. Leave Tuna Harbor and continue along the Embarcadero. 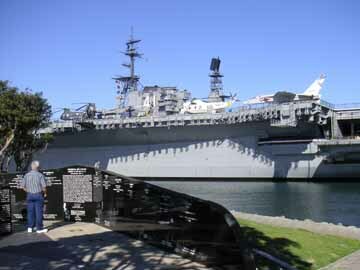 You are now approaching the San Diego Aircraft Carrier Museum, a naval aviation museum located on the U.S.S. Midway. In 1908, President Theodore Roosevelt's Great White Fleet stopped at San Diego. It was returning from a round-the-world tour whose purpose was to demonstrate U.S. naval strength. Since then, naval installations have become a major presence in the San Diego area. Today they include a Navy hospital, naval station, Marine Corps recruit depot, Marine Corps base, ocean systems research center, and two naval air stations. There are approximately 100,000 sailors and Marines on active duty in San Diego County, and dozens of ships make San Diego their home port. Your next stop is the Broadway Pier. From the pier you can see across the bay to the North Island Naval Air Station. Farther across the bay is the residential peninsula of Point Loma. To the east you have a fine view of the skyline of downtown San Diego. And to the north lies the Cruise Ship Terminal. As you leave the pier, you can see a Visitor Information Center on the other side of Harbor Drive. 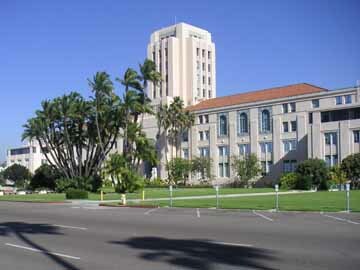 This is run by the San Diego Convention and Visitors Bureau, and provides information about all of San Diego County. Walk to the left, heading north. Immediately on your left is the dock for the San Diego Bay Ferry. This pedestrian and bicycle ferry leaves on the hour for Coronado, from early morning to late evening. 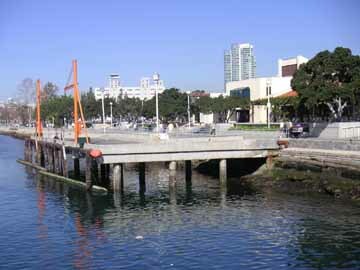 In Coronado it docks at the Old Ferry Landing, near the foot of Orange Avenue. Return trips from Coronado leave on the half-hour. 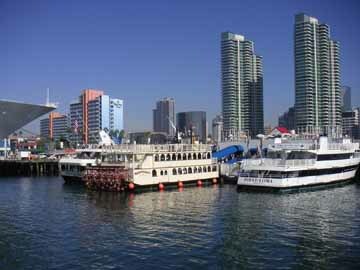 Nearby are the harbor cruise boats of the San Diego Harbor Excursion and Hornblower Cruises. Both companies offer excellent one- and two-hour tours around San Diego Bay, as well as dinner cruises in the evenings and brunch cruises on Sunday mornings. Ticket offices are a short distance down the Embarcadero. Beyond the harbor tour boats you come to the Cruise Ship Terminal. Some cruises originate here, while others are making San Diego a port of call on their itinerary. Many cruises heading from Los Angeles to Mexico make San Diego their first-night stop. Continuing along the Embarcadero, you discover the spars of the Star of India standing out against the sky. 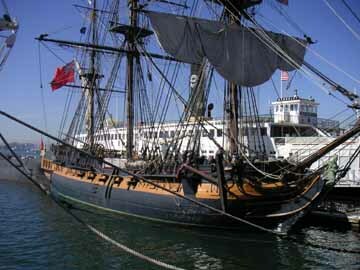 It is the flagship of a group of ships that make up the San Diego Maritime Museum. Launched in 1863, the Star of India saw a lot of sea before she came to rest at San Diego. At first the iron, square-rigged sailing vessel carried cargo between England and India, then she carried emigrants from England to New Zealand and Australia on a route that led her to circle the globe 27 times. She next transported timber from Puget Sound to Australia, and finally, from 1902 to 1923, carried salmon from Alaska to the West Coast. 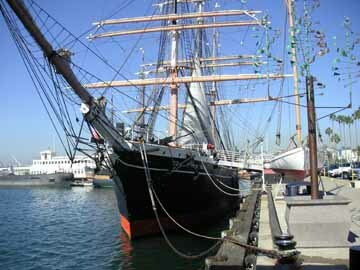 Then, after many years of retirement, she was restored and opened in 1961 as a maritime museum in San Diego. Now she has been joined by several other ships. The luxurious Berkeley ferried passengers across San Francisco Bay from 1898 to 1958. The lovely Medea was built in 1904 for a wealthy Englishman who used her to go hunting for grouse and deer. Other ships include a Soviet era attack submarine and the H.M.S. Surprise, the ship used in the film Master and Commander: The Far Side of the World. When you have finished visiting the Maritime Museum, you need to decide how you want to return to your starting point. One way, of course, is to return by the way you came, perhaps stopping on the way to take one of the bay cruises. An alternative is to return by using the San Diego Trolley, which runs every 15 minutes during the day. (To confirm the schedule, or to check for holiday hours, visit www.sdmts.com.) There is a trolley station on Cedar Street (see map), on the far side of the County Administration Building. Buy a ticket for $1.25, and board a trolley marked "Blue Line to San Ysidro/Tijuana." Get off at the America Plaza station, cross the tracks, and board a trolley marked "Orange Line to Downtown San Diego & Convention Center." Get off at the Seaport Village stop.